- Measures: Width: 220 cm Depth: 058 cm Height: 230 cm Weight: 1300 kg - 2 year Guarantee! - Free Shipping! 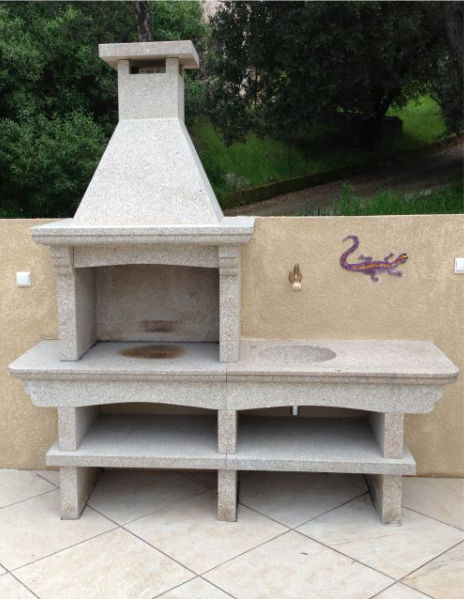 Natural Stone BBQ GR61F. Free shipping to England, metropolitan France*, Monaco, Belgium, Luxembourg, Italy and Spain. For other destinations pleasecontactus. 700g mixed vegetables such as baby corn and carrots, asparagus, small courgettes, broccoli florets, green beans, sugar snap peas 3 tbsp Filippo Berio Extra Virgin Olive Oil 3 tbsp summer herbs, chopped e.g. parsley, chives, tarragon, chervil 1 garlic clove, crushed (optional) Salt and freshly ground black Pepper. Put the vegetables into a large bowl, pour over the oil, add herbs and garlic (if using) and season, toss together. Divide the vegetables between four 30cm squares of extra thick foil, then bring the sides of foil up and around the vegetables to make parcels. Cook on the barbecue in a medium heat area for 20 minutes.